Standardized Invoice Processing Produces Efficiency Gains The Cosmopolitan of Las Vegas is a unique luxury resort offering a decidedly different perspective, situated in the heart of The Strip in Las Vegas. Opened in December 2010, the resort’s uniquely vertical multi-tower design offers spectacular views of the vibrant city. The new 2,995-room resort features oversized, residential-style living spaces with expansive, one-of-a-kind private terraces. The Cosmopolitan’s luxurious resort amenities include a 100,000 square-foot casino; Sahra Spa & Hammam; three unique pool experiences at The Pool District; Marquee Nightclub & Dayclub at The Cosmopolitan, a multi-level integrated nightclub; a diverse and dynamic restaurant collection; nine eclectic retail boutiques and 150,000 square feet of state-of-the-art convention and meeting space. Mr. Anthony Pearl was appointed as General Counsel of The Cosmopolitan in November 2008, and knew from prior experience that the company would be able to achieve significant cost savings in the operation of its legal department if they deployed a robust technology system to assist with matter and spend management. Mr. Pearl’s in-house team made a list of features and functions that were important to them and set out on an initiative to examine potential software tools that aligned with those needs. One of Mr. Pearl’s marching orders was that the team should choose a product that had a proven track record of use in other highly regarded corporations. “I didn’t want to take a flyer on a start-up product with no history of implementations at major enterprises,” said Mr. Pearl. The search team narrowed their scope of research down to three matter management and e-billing products. After doing comprehensive demonstrations and conducting extensive tests of all three final products, Mr. Pearl’s team selected LexisNexis CounselLink as their spend management solution. 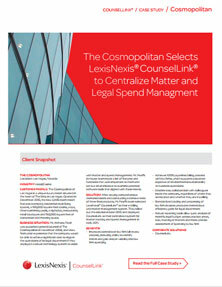 LexisNexis CounselLink enables corporate legal departments to more effectively and efficiently manage their legal spend and matters, while optimizing relationships with outside counsel. Through its flexible system configuration, CounselLink can address the unique requirements of both large and small law departments, and the LexisNexis product support teams help users maximize the benefits of the system. Streamlined bill review–Since the deployment of the CounselLink solution, The Cosmopolitan has been able to streamline its bill review processes and gain deeper visibility into outside counsel spending patterns. As the year progresses and metrics become more meaningful, Mr. Pearl is confident that CounselLink will have produced significant cost savings in the line-item review of invoices and more compliant law firm billings. Enhanced collaboration–With CounselLink as their matter tracking information hub, Mr. Pearl is able to more effectively collaborate with his colleagues inside the company, regardless of where they are located and whether they are traveling. “We have lawyers working in multiple office locations, so CounselLink allows us to work together in a seamless manner on one platform,” he explained. Standardized billing–CounselLink has standardized the process for coding and processing law firm invoices, which produces tremendous efficiency gains for The Cosmopolitan’s legal department. Reporting Tools–The robust CounselLink reporting tools allow for a quick analysis of the monthly legal budget across practice areas, easy tracking of matters and more precise assessment of spending by law firm. “For example, I like to quickly assess our spending within specific areas of practice, the ratio of partner-to-associate hours we’ve been billed by each of our law firms and other important metrics that help me evaluate our legal spending,” said Mr. Pearl. The Cosmopolitan of Las Vegas is a unique luxury resort situated in the heart of The Strip in Las Vegas. Opened in December 2010, the new 2,995-room resort features oversized, residential-style living spaces, a 100,000 square-foot casino, a spa, three swimming pools, a nightclub, restaurants, retail boutiques and 150,000 square feet of convention and meeting space. Mr. Anthony Pearl was appointed general counsel of The Cosmopolitan in November 2008, and knew from prior experience that the company would be able to achieve significant cost savings in the operations of its legal department if they deployed a robust technology system to assist with matter and spend management. Mr. Pearl’s in-house team made a list of features and functions that were important to them and set out on an initiative to examine potential software tools that aligned with those needs. After viewing comprehensive demonstrations and conducting extensive tests of three final products, Mr. Pearl’s team selected LexisNexis® CounselLink® as their e-billing and matter management system. They rolled out the solution in later 2010 and deployed CounselLink as their centralized system for matter tracking and spend management in early 2011.